alaTest has collected and analyzed 972 reviews of Apple iPad 6 (6th gen 2018). The average rating for this product is 4.8/5, compared to an average rating of 4.5/5 for other products in the same category for all reviews. Reviewers are impressed by the size and screen. The price and usability are also appreciated. There are some mixed comments about the camera. We analyzed user and expert ratings, product age and more factors. Compared to other products in the same category the Apple iPad 6 (6th gen 2018) is awarded an overall alaScore™ of 97/100 = Excellent quality. 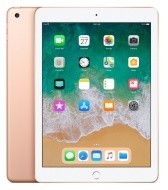 The iPad 2018 packs the much of the goodness of the Pro at half the price. It also works as a low cost laptop, if you but a keyboard case. Apple's new iPad is more powerful and brings Pencil support, and a bevy of software initiatives and app improvements show emphasis on education. New features are mostly aimed at creatives, but either way the iPad remains a prodigious AV tablet. The 2018 entry-level iPad supports the Apple Pencil for art work and annotation, and adds a faster A10 processor. iOS continues to offer the best overall selection of free and paid apps on affordable tablets. Lacks the bigger, better screen, quad speakers and Smart Connector found on pricier iPad Pros. The Pencil, case and keyboard add-ons will bring the price up to laptop level. Thick bezels; Apple Pencil, keyboard and cover all cost extra ; The new 9.7-inch iPad provides plenty of power, long battery life and Apple Pencil support, all for a fairly affordable price, even if this slate is not a Chromebook killer. The budget iPad from 2017 has been updated – Apple says it's an iPad for education, but it's actually a really impressive tablet for the general user who wants to get a great experience – and having the Apple Pencil support on there as well is great.